The body of McCormack (24) was discovered in a field on the Meath/Kildare border in December 2017. 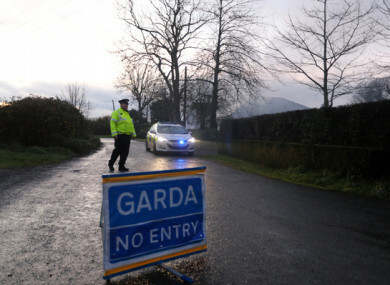 Gardaí at the scene of in December 2017. GARDAÍ IN MEATH have arrested a man in connection with the 2017 murder of Kane McCormack. The body of McCormack (24) was discovered in a field on the Meath/Kildare border at Walterstown, Dunboyne in December 2017. He was shot dead. McCormack’s car was parked at the Aldi supermarket in Clonee village at 5pm on the Friday before his body was discovered, gardaí said at the time. After parking his car, McCormack got into a black saloon and this car then left the carpark and turned right towards Dunboyne, gardaí said. Shortly after 6pm that day, gardaí in Finglas responded to a call that a black Audi saloon car was on fire just off the M50 at Meakstown Cottages. McCormack’s body was discovered the following afternoon. McCormack was the son of Noel Kirwan who was shot dead in December 2016. His death is believed to be connected to the Hutch-Kinahan feud. The man, who is in his 40s, was arrested by gardaí today in connection with McCormack’s murder. He is currently being detained under Section 4 of The Criminal Justice Act. This is the second arrest in relation to the investigation. No charges have been made. Email “Man arrested in connection with 2017 murder of Kane McCormack”. Feedback on “Man arrested in connection with 2017 murder of Kane McCormack”.